Meet Kate, she has been using the Bkool Go for a week or two (as this is being written) and if anyone can give you an honest review then Kate can. She came in to this with no predetermined opinions or expectations. If you want to get a more technical lowdown on the Bkool Go we do have a detailed overview here, or you can click here and head over to the Official Bkool website. 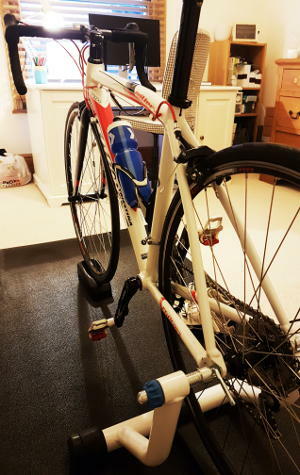 Carry on reading though if you want a real life user experience of someone trying out the Bkool Go Turbo Trainer for the very first time and to get their experiences, comments, and overall opinions on how this trainer really performs. Also, maybe most importantly, is it worth buying? I am going to be honest here. This is my very first time using a turbo trainer! To say it has been interesting and fun is an understatement! Let me set the scene a little… I’m a young at heart lady of a certain age (less said about this the better!) who loves cycling but has struggled to do many miles over the past few years due to work commitments and also not liking the cold – hence winter miles is not something I have ever contemplated. The Bkool trainer has been a bit of a revelation in terms of opening my eyes at what can be done indoors, in safety and in the warmth! My big goal this year is being fit and strong on the annual company charity ride. Each year we do a coast to coast and I have, without fail, always been unfit, shattered and have fallen ill after the event. Bah. No more! The Bkool trainer arrived in a large box and it took literally minutes to unpack, read the instructions (yes boys, women read the instructions) and get laid out. The actual setup process was excellent. One power cable which goes in the back, set the actual trainer up so that the wheel is correctly placed at the back position and then unscrewed the spindle ready for the bike. Ah, my bike. THE BEAST. It is a heavy old thing that is being upgraded this year (I hope!) to a carbon beauty. To be fair, removing the skewer from the back wheel and replacing it with the one supplied was a doddle. Once suitably tightened, I lifted the bike in place and tightened the screws to hold it firmly in place. software. So, off to the Bkool website I went. I registered using the included three month premium code that you get with the trainer that allows you to use the Bkool training software for three months free. Well thank you very much, a nice touch. I then downloaded the app for the Mac and logged in. You are greeted with a number of options from choosing workouts to riding the video routes of real stages and climbs. The pairing process with the trainer was straight forward too. I was using Bluetooth from the Mac and the Bkool software immediately saw the trainer so this was literally a one click process. I am also using a heart rate monitor and a cadence sensor, both connecting easily to the Mac via Bluetooth. These are well worth using and relatively inexpensive to purchase. 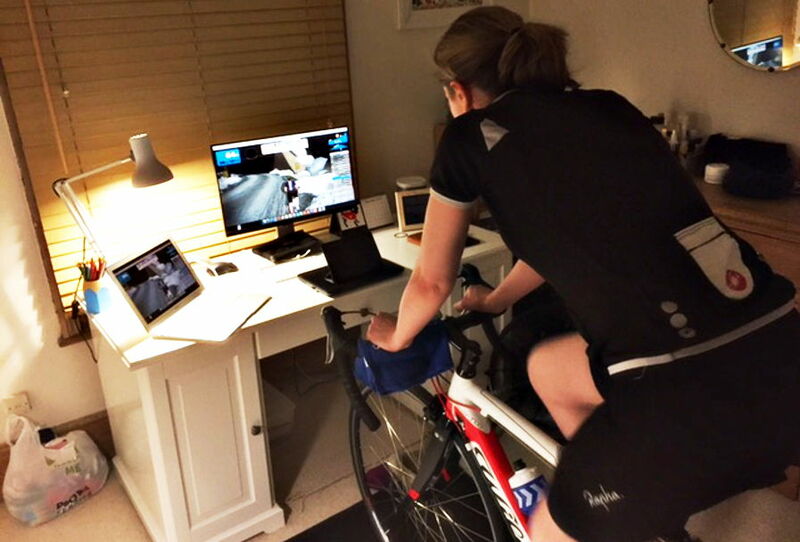 The Bkool software (AKA Simulator) cleverly alters the resistance of the trainer when riding, so whether doing the power based workouts or the climbs, it gives a very realistic effect of having to work hard which is exactly what I need for my coast to coast ride! (I am sure it is my heavy bike slowing me down really in the real world!). The fact that you are watching the screen, whether a workout progress, or enjoying some stunning scenery on one of the virtual routes means that the time flies by. I heard horror stories of people almost falling asleep on trainers because it is so boring. I promise you, it is not boring. Far from it! When on the bike, the Bkool trainer gives a real sense of confidence. I can be out of the saddle and feel rock solid and really able to put in some efforts (not much power yet!). I have always thought that setting up and using a trainer would be hard work and a lot of my male friends use them, but not many female friends. Ladies, girls, do not be put off! I am not massively experienced with cycling and I would certainly not call myself a techie. I managed everything easily and it was actually a good learning experience too. I cannot recommend the Bkool trainer enough for someone who is starting out in the world of trainers. The trainer combined with the Bkool software makes the whole experience fun and and very worthwhile. Being able to track my miles, routes and workouts mean I have a permanent log of my achievements recorded in the app. It can’t all be perfect. Right? One thing that I did find is that the software is slightly confusing when using. It could be made more clear the options for joining workouts and the virtual rides. I am still unsure about the ride timings and actual joining others. Also, the sign up process and using the free three month code could be made more clear. When I used the code it was not clear it was accepted and only made clear during the checkout process of signing up for premium account. Even though I have three months free, I still needed to put in card details for payment. I must admit, I don’t like this. I am more than capable of adding them at the end of the trial. Last but not least, it is not clear (at least to me) what the differences between premium and not premium are. I could not see a difference when using the app. Having explored more, it seems to be that you have unlmimited rides and workouts when premium and limited when not. Would I recommend the Bkool Go? Overall, the actual trainer is excellent and works as advertised with the Bkool software. I’d love to see some introductory videos about using the software. This would be incredibly helpful. 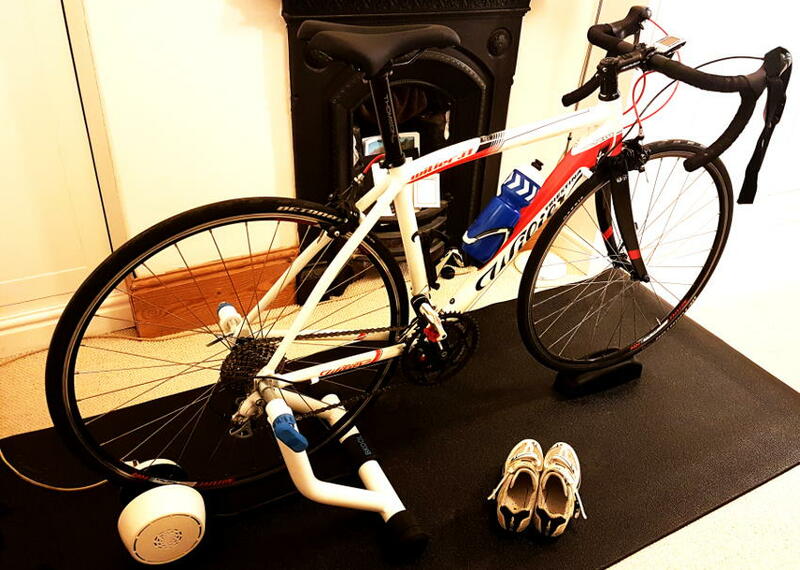 However, as I said this is a great turbo trainer. 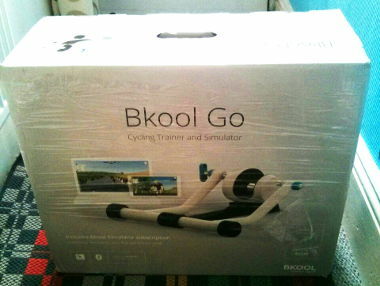 I have not tried others because I am very new to the whole world of indoor cycling, but as first impressions go I am very impressed and can only recommend it based off my experiences with the Bkool Go and Simulator software. So, what are you waiting for? Go get a Bkool trainer!